What is better than a Yankee Candle? A Yankee Candle that is smokeless and mess-free. That’s right. With the Yankee Candle Scenterpiece Easy MeltCup Warmer that is exactly what you get. The Scenterpiece Easy MeltCup Warmers are a new range of flameless heaters from Yankee Candle designed to melt wax quickly and efficiently, leaving your home smelling delightful. I was sent a Scenterpiece Warmer along with a selection of four Melt Cups. Here is how I got on unboxing this latest addition to the Yankee Candle UK family. As you can see, my Scenterpiece Warmer is in white ceramic and has a pretty country basket weave running all around the outside. It is a good weight, so should be stable enough on a raised surface like a mantelpiece. What I liked about the Warmer is that it comes with a six feet long cord. So you can place the Scenterpiece pretty much anywhere you like in your home and not necessarily right next to an electricity socket. The other thing is that the heating dish is recessed providing a clean contour to the Warmer. The MeltCups sit snugly in the dish and all you see at eye level is the pretty dove white exterior of the Scenterpiece. Midnight Jasmine – a sensual floral mix of water jasmine, sweet honeysuckle, neroli, and mandarin blossom. Turquoise Sky – reminiscent of ocean waves and adventures beneath bright blue skies, this fragrance has hints of sea grass and musk floating on salty sea air. Mango Peach Salsa – sweet and juicy mangoes and peaches spiced with citrus, ginger flowers and pink pepper, this is perfect to liven up a summer evening. Christmas Eve - traditional festive scents of a warm hearth, sugared plums, and candied fruits, this will be great for later in the year. The MeltCups are made of heat resistant plastic. All I had to do was pop open the lid, place the cup holding the wax in the heating dish, plug in and switch on the Scenterpiece Warmer. I started smelling the fragrance within minutes. In the first instance, I tried the Turqoise Sky and burnt it for about an hour and a half. My house smelt of sun, sand and sea even the next morning! You don’t usually get such a long-lasting effect with traditional candles, so this is an obvious bonus. Another thing that struck me about the Scenterpiece is that as the wax stays contained in the heat-resistant cups, you can swap over to another fragrance with literally no fuss. All you do is switch off the power, wait for the unit to cool down before removing the used MeltCup and replace it with a new one. Replace the lid on the used cup and set it aside to re-use on another day. Each MeltCup can be used for up to 24 hours. The Yankee Candle Scenterpiece Easy MeltCup Warmer would be a great addition to your home. They come in five designs so you can pick one to suit your taste and to go with your home décor. They would also make a lovely housewarming or, hold it, Christmas present. 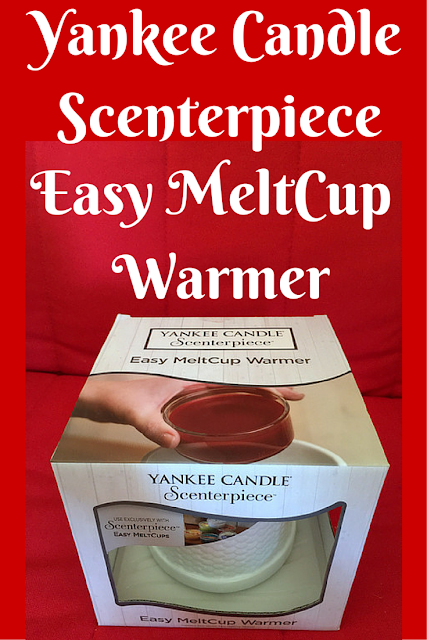 Disclaimer: I was sent a Yankee Candle Scenterpiece Easy MeltCup Warmer and a selection of Melt Cups for the purpose of this review. All opinions are my own. Love the scent of a Yankee Candle. I'd like this warmer for autumn when the darker evenings appear as I like the house to smell of rich cinnamon and vanilla. Ohh I love yankee candles, I have never seen this melt cup before. I think I will need to invest in one of these! I really like Yankee Candle, I have a few. I've not used the Meltcups though - so that's a new one to try! Love it, Yankees are my favorite! Love Yankee so much best candles around we also had the wedding day one at our top table. I've only recently bought my first Yankee candles, this sounds great. I bet it smells fantastic. My son is nine and is obsessed with Yankee Candles and anything involving gadgetry, so he will totally want one of these! This looks perfect! I have some Yankee wax melt style things at home and need something like this! I bet they smell divine. Ooh these sound gorgeous! I bet I'd like the Christmassy one best. I love Yankee Candles, had one burning last night!